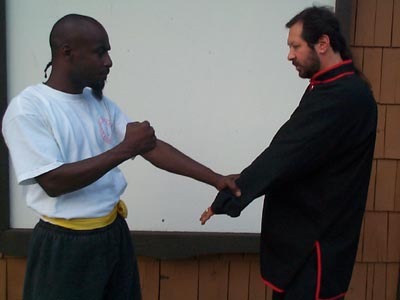 Victor Jordan has grabbed Sifu Winokur's left wrist with his right hand preparing to punch with his right. 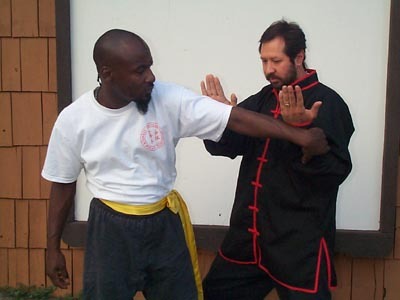 Sifu Winokur with his right hand palm, strikes the back of their arm or push them as you turn your feet to horse stance (feet apart shoulder distance) facing them. 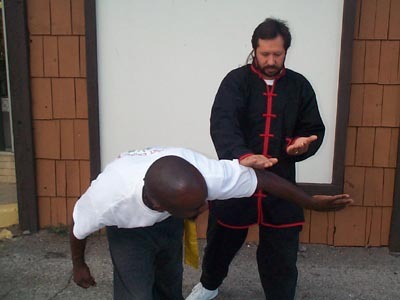 Striking here will cause pain and you will free yourself from the attacker's hold. Hold tightly with left hand on attacker's wrist. Victor (attacker) has lost his balance and has moved slightly forward. Slide your right hand up and grab attacker's shoulder for better balance. Raise your right knee and strike either the back of the leg (hamstring) or the side of the thigh (between hip and knee.) This will cause extreme pain if you strike too hard. 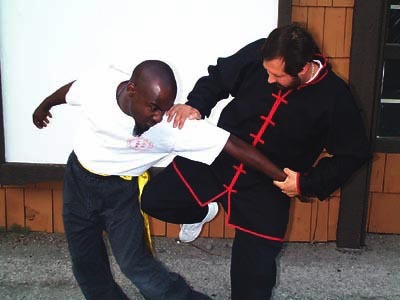 Follow up with a side kick to back of attacker's knee to push them to the ground. Or pull them backwards and sweep their right leg and they will fall on their back.